Disgraceful Santa Ana Cops Respond To The Dispensary Raid Video. Can You Believe This? 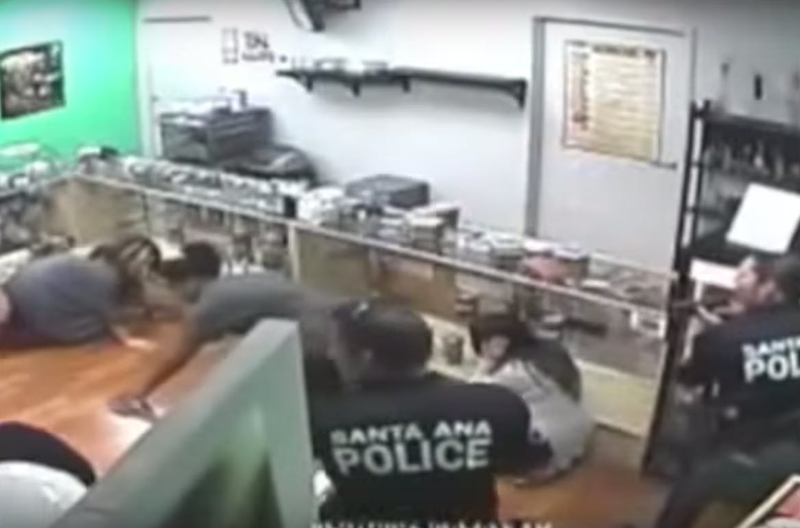 Do you remember the unbelievable Santa Ana cops dispensary raid? Well, now see what these cops are trying to do about it. It’s even more unbelievable! Hopefully you all have seen the absolutely disgraceful video of Santa Ana cops who raided the Sky High Collective dispensary on May 26th and were caught making derogatory comments about patients, playing darts, and even eating edibles. What they didn’t know was that there were some cameras that they failed to destroy. As far as the derogatory comments go, one police officer insulted an amputee stating, “I was going to punch her in the f—ing nub.” The patient that the officer was referring to had spoke to OC Weekly and gave her reactions to seeing the video herself. The comment made by the police officer alone is an absolutely terrible comment to show how heartless these cops were. However, what’s even worse? These police officers are filing a lawsuit to bury the videos that showcase their disgraceful actions. Matthew Pappas, a lawyer for Sky High Collective, was taken back by the officers’ actions to remove the video as evidence to be used in court. “It’s pretty pathetic for police to say if we don’t like something that it can’t be used as evidence,” Pappas said to the Orange County Register. However, the Santa Ana officers are claiming that the video violated their privacy. Regardless, the video says it all and we can clearly see how wrong these officers were. They know they screwed up, and now they want that evidence destroyed since they failed to destroy it themselves.